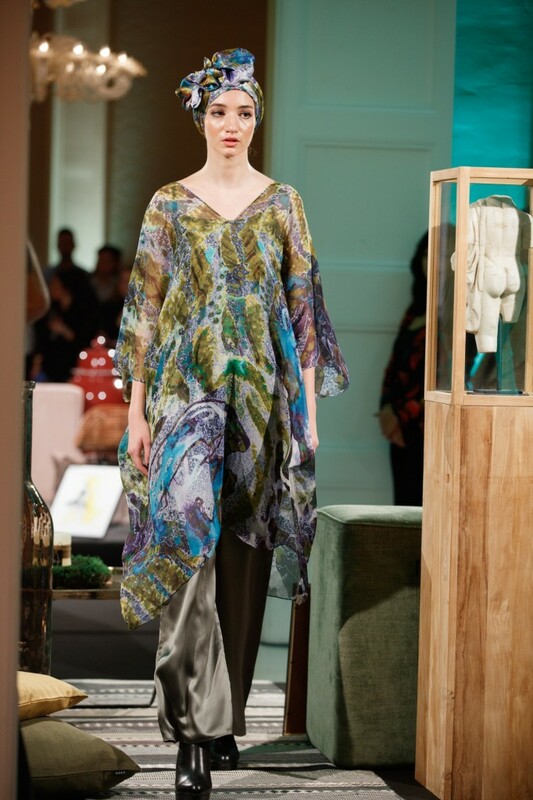 This collection was inspired by Paul Poiret and exhibited at the beautiful Palazzo de Piro in Mdina, Malta. It takes classical fashion ideals and gives them a modern twist. If you are not familiar with Paul Poiret, do look him up because his work is truly fascinating. He was a leading fashion designer in Paris in the early 1900s. He designed costumes for the avante-garde Russian Ballet, the Ballets Russes, which performed in Paris at the time. Being very much inspired by Eastern Orientalism, Poiret created the most elaborate pieces in opulent colours, reminiscent of Maharaja. In fact, he was considered a break-through in Paris fashion as he designed the ‘harem’ pant for women. Loose fitting, wide and in bright and lustrous fabrics, harem pants were first scorned at by the traditionalists. Wide trousers for women were unheard of in a time of ultra-thin, corseted waists and full skirts. However, the more adventurous of the lot adored them and harem pants alongside loose fitting ‘lampshade’ tops and turbans became the ultimate style statement in womenswear at the time. This day meets night collection takes elements from Orientalist inspired fashion and plays with them. From silk satin turbans to wide fitting kimonos and trousers, the collection encapsulates all things bold and vivid. Fabrics range from soft as butter silk chiffons to cotton velvet shawls and capes made especially for the winter months ahead. You will even find warm virgin wool lined with fine silk cotton in this collection – an unusual combination that creates a sturdy shape around the body, yet it is softened by the printed silk design. Get your hands on these super special wool and silk products quick as they are all unique and come in limited supply, or choose your own combinations today by contacting us.